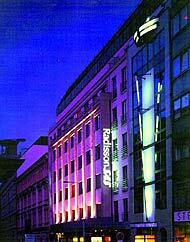 The five-star “Radisson SAS” Alcron Hotel is located just a few steps from the famous boulevard, Wenceslas Square, the commercial and social center of modern Prague. Originally opened in 1932 as the “Alcron” Hotel, luxurious and modern for its time, the hotel enjoyed the enviable reputation of being the "in" hotel during Prague's lively Jazz-age. Today, this deluxe Art Deco hotel has been meticulously restored to its former glory, under the management of "Radisson SAS". Much of the interior was preserved, including the glittering chandeliers, the rich Italian marble and the creamy milk glass that can be seen throughout the hotel. 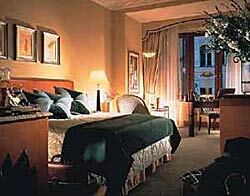 There are 211 exceptionally comfortable and inviting rooms and suites with high ceilings and classic period furnishings. You can choose from either elegantly designed single or double rooms or select one of several luxurious suite options such as Junior, Executive or Presidential. The hotel's elegant Art Deco restaurant, “La Rotonde”, serves a delectable choice of international cuisine and traditional local dishes. Talented chefs enjoy the challenge of creating an unsurpassed dining experience for all guests as well as banquets for conference delegates. A lovely outdoor terrace provides informal dining in the summer months. Serving cocktails and snacks, the hotel's chic Art Deco "Be Bop" Bar is a popular meeting place to enjoy live jazz music, played by local musicians.